A glassy carbon electrode electrochemically modified with iridium oxide (IrOx) has been developed for amperometric quantitative detection of iodate. Two-step potential cycling was used to deposit layers of IrOx onto glassy carbon surface. 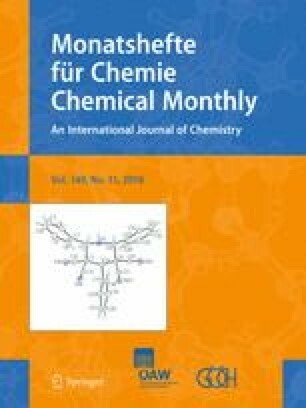 A stable reversible redox couple was observed at the surface of modified electrode in both acidic and neutral solutions. 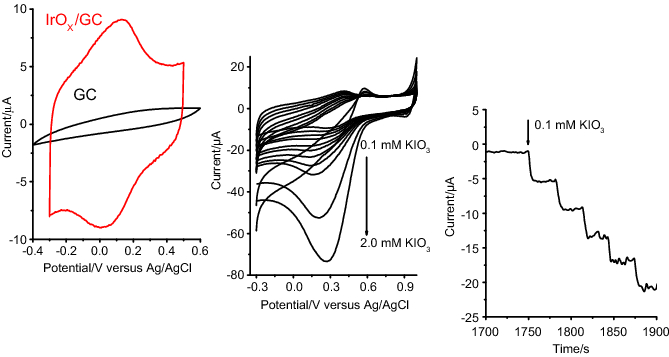 The electrochemical behavior of the modified electrode IrOx/GC and the catalytic activity in electroreduction of iodate at pHs 1.0–4.0 were explored by means of cyclic voltammetry and constant potential amperometry over the potential range from 0.2 to − 0.2 V (vs. Ag/AgCl, 3 M KCl). As optimal operational parameters of IrOx/GC at pH 1.0 have been defined: working potential of − 0.2 V, sensitivity 739.7 µA mM−1 cm−2 (r2 = 0.982), linear dynamic range from 1.0 to 4.6 mM, detection limit of 0.5 µM and response time of 8 s. The modified electrode showed excellent analytical performance — high sensitivity, linearity, reproducibility (the precision for 5 replicate determinations of 0.1 mM iodate was 1.68% RSD), stability (92% of its initial response to iodate after 1 month), and remarkable anti-interference performance, defining it as a promising material for electrochemical sensor application.